Novelist Willard Motley was born in Chicago, Illinois on July 14, 1909 to parents Florence “Flossie” Motley, his mother, and a man referred to by the family only as “Bryant,” who was his biological father. Bryant was a 36-year-old Pullman porter living in the Motley family home at the time. His mother was the daughter of Archibald, a Pullman porter and Mary “Mae” Frederica Huff Motley, a public school teacher, both of whom hastily married his 14 year old mother to Bryant during her pregnancy so that Willard Motley’s birth would not be illegitimate. After the birth, the marriage was annulled. Willard Motley was told growing up that his grandparents, Archibald Sr. and Mary, were his parents, and his mother, Florence, was his sister. Willard Motley and his uncle, Archibald Motley Jr., who would later become a prominent artist, were raised as brothers. 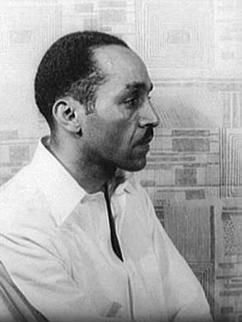 Bryant impregnated Flossie again, resulting in the birth of his sister, Rita Motley who was also raised as a child of Mary and Archibald Motley, Sr.
Motley’s first job came at the age of 13 when he wrote a weekly column under the pseudonym “Bud Billiken” in the children’s section of the Chicago Defender, one of the nation’s largest black newspapers. Over time his articles became one of the more popular features of the newspaper. Motley meanwhile attended Englewood High School, graduating in 1929. He considered attending the University of Wisconsin but was unable to do so due to financial limitations. Instead he returned to his family home and went to New York in 1930 and to the western United States in 1936 to inspire his writings. He also worked at different jobs throughout the years, including jobs at a brewery, a neighborhood store, and a dress factory. In 1939, at the age of 30, Motley left the family home permanently and moved to the Maxwell Street Neighborhood, a notorious Chicago slum known earlier as the site of Jane Addams’ Hull House and later as the center of blues music in the city. While there, Motley began to conduct research on social conditions in the neighborhood and created Hull House Magazine to publish fiction about the area. Much of his research took him to the Cook County Jail, where he interviewed inmates about their lives. He wrote a narrative about the trial of Bernard “Knifey” Sawicki, which brought renewed attention to his ability as a writer. Motley’s most famous work, the novel, Knock on Any Door, appeared in 1947. The novel described the life of Nick Romano, an Italian American altar boy who was lured into crime because of his poverty and eventually becomes a hardened criminal due to the penal system. Knock on Any Door received glowing reviews in 1947 and made the New York Times Best Seller list after selling 47,000 copies in its first three weeks in print. In 1949 it was adapted into a movie of the same name, starring Humphrey Bogart. Later Motley novels included We Fished All Night (1951) and Let No Man Write My Epitaph, a 1958 novel which became a Columbia Pictures film in 1960. His final novel, Let Noon Be Fair, appeared in 1966 after his death. Willard Motley, who moved to Mexico City in 1952, died there on March 4, 1965. Alan Wald, “Willard Motley,” Writers of the Black Chicago Renaissance (Urbana: University of Illinois Press, 2011); http://libguides.niu.edu/motley;http://articles.chicagotribune.com/1994-06-26/features/9406260209_1_black-kids-chicago-post-chicago-defender.